Two things – egg tarts and meat jerky! That’s what I’ve been told. Never leave Macau without tasting these 2 delicacies. 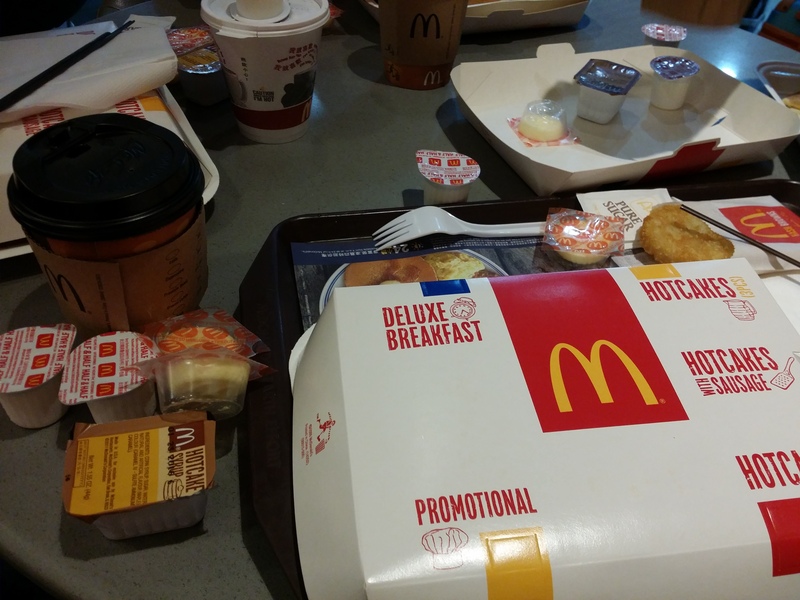 And so because we reached Macau Airport at 11:15AM, the first stop in my itinerary is lunch. 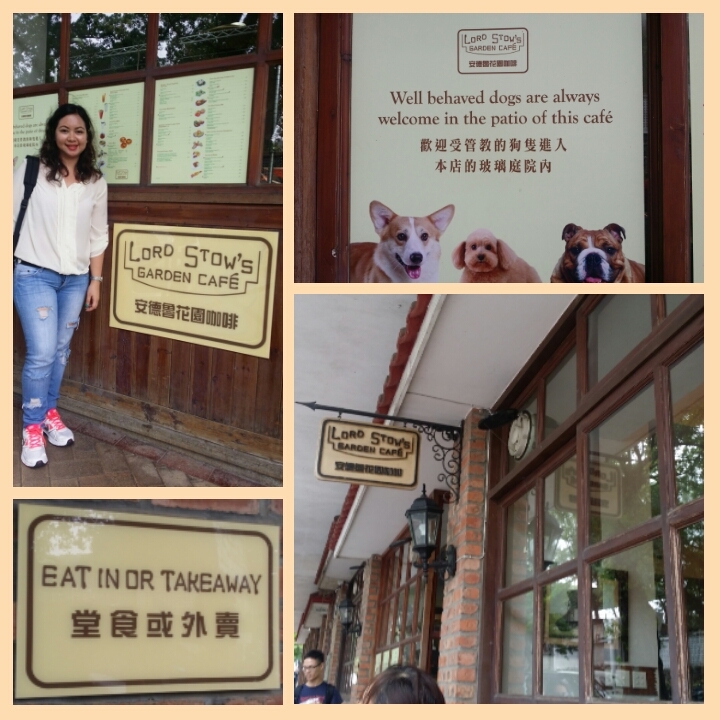 I targeted to eat in the famed Lord Stow’s Garden Cafe in Coloane, Macau. With some research I found out that Lord Stow did the original recipe of egg tarts. There are other branches of Lord Stow in Macau but the oldest existing is in Coloane. After collecting maps and several inqueries from the information center inside MFM, we rode Bus 26 Coloane (3.2HKD per person). Bus 26 takes a different route from Bus 26 Coloane, we were told, so be mindful. No sweat locating this cafe as terminal of this bus route is exactly at Lord Stow’s. It was luchtime when we arrived so we had to wait to be seated. When the door opened and a staff asked us, “For how many?” I said, “Tatlo (three)” sensing that he is Filipino. He smiled and responded grinning, “Ah, tatlo.” He is indeed Filipino! We overheard the table next to us speaking in Tagalog also. They are a group of religious man and women on retreat. They later invited us to their conversation as they also recognized us. 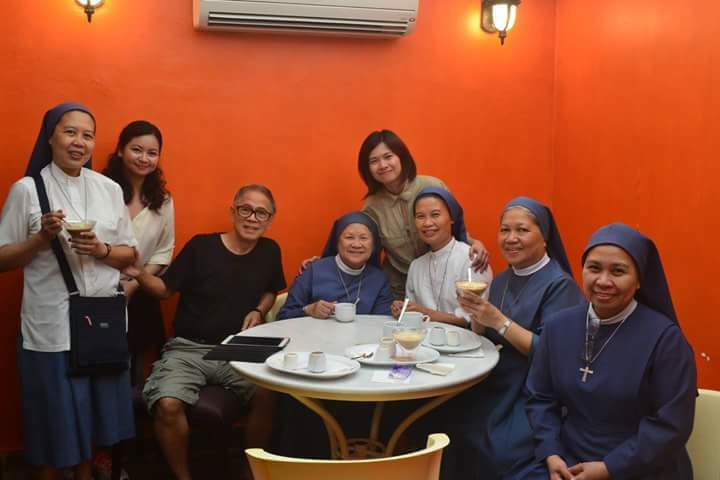 Father John and the nuns on retreat. They were very gracious and made our first few hours in this foreign land felt like home. Father John, the priest, seemed to be already living in Macau for a while. The Filipino waiter already knows him and jokes with him a lot. If I heard it right, he is assigned in St. Francis Xavier, our next stop. He made sure the rest of his company enjoys their lunch. Servings in Lord Stow’s is good for sharing! I had half of my order taken out for merienda. Customarily, they serve hot water as “service water”. The egg tarts were excellent! We didn’t expect it to not taste sweet as it smelled really nice and creamy. That made it all the more enjoyable, though. I especially liked the bread or crust which is flaky and comparable to Cebu’s otap. Worth it! It’s just Day 1 but I have all the intentions to bring this home to Bulacan for pasalubong. Egg tarts are best served hot and we don’t have microwave oven at home so Marlyn had this really great suggestion of buying one just for the egg tarts! This restaurant is hard to miss if you ride Bus 26 Coloane from Airport. Please note that there are Lord Stow’s bakery somewhere in Binondo. Not sure if they have the egg tarts, though. We came back to Macau, four days after. Upon checking in to our hotel near Senado Square, we started our stroll. 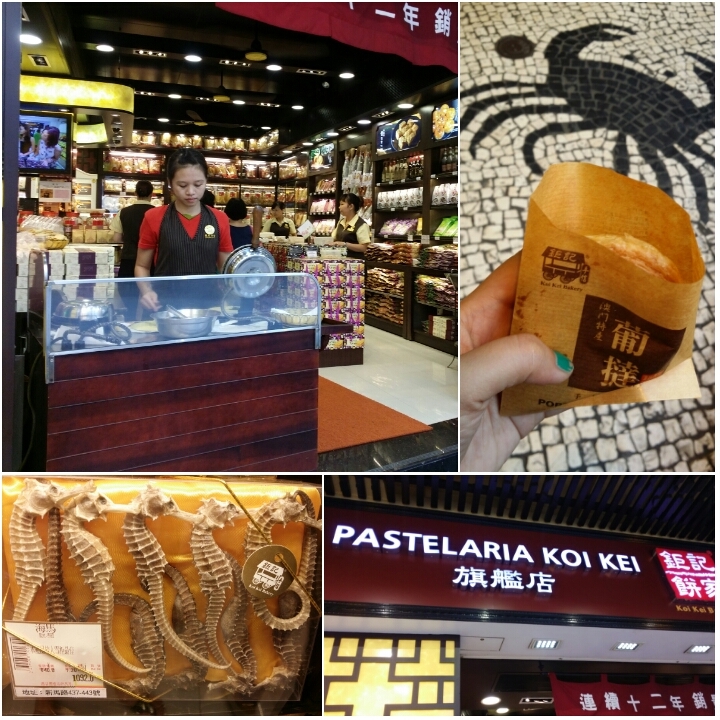 On our way to St. Paul Ruins and Senado Square, we passed by a lot of stores selling egg tarts and meat jerky but one store we were naturally attracted to is Pastelaria Koi Kei. Unlike other stores, their meat jerky looked sanitary not to mention that everywhere we go, we see people with Pastelaria Koi Kei bags in their hands even during our first day in Macau. We got curious and me especially bought most of my pasalubongs from here. The cashier gave me free mooncake because of my purchase. Customer service is good by the way. Coming from not so hospitable experiences in Hongkong, I find Macau kinder to foreigners. They’ve got lots of free tastes, too! We have to try a restaurant which we think ordinary people in the area eat to casually. As they say, when you travel, you eat when you’re hungry and wherever convenient. In a corner, we found this restaurant which served rice meals! Hallelujah! I rediscovered the glory of Yang Chow! I don’t know if it’s because it saved me from my 6 days of rice deprivation or it really is good especially when authentic. I’m craving for it until these days that I’m already back in Manila. There is a food court one level up from Venetian Macau’s Casino. They serve American and Asian food. Shops and kiosks, duty free chocolates also abound this hotel and casino. There is in fact a branch of Lord Stow’s inside where I bought Almond (MOP40) and Dark Chocolate Chips (MOP45) cookies. Nothing special about this ice cream scoop except that it’s Haagen Dazs ice cream and that it was inside Venetian Macau! While paying for this, I keep on telling myself, “Don’t convert! Don’t convert!”, as this scoop was really pricey. Part of traveling like a local is thinking and spending like a local. So think in HKD and MOP not in PHP. Admittedly, I’m not very adventurous when it comes to food. Even back here at home, I tend to choose home-cooked meals and Filipino dishes more than anything else. I also prefer the classic flavors of almost any food that I’m used to. Therefore, this post is useless if you’re looking for unique food finds in Macau. For the picky eaters like me who would rather starve than eat anything that irks me, this post is a survival guide. Airport meal before boarding our flight back to Manila.